London is an exciting city, boasting great food, interesting sights, and some of the top world class hotels and spas. If you are visiting the British capital, you must add these to your bucket list. After all you do deserve some pampering. Nestled in the heart of The Connaught, another world is waiting for you. Aman Spa at The Connaught is a sensation for the senses. From the moment you step into the spa, you are invited to unwind, take a journey of discovery and reconnect mind, body and spirit. With a focus on wellness, there are many special treatments that are exclusive to this spa. It is worth a visit. The Bulgari Spa inside the award winning hotel, has an enticing selection of beauty and health-enhancing treatments. 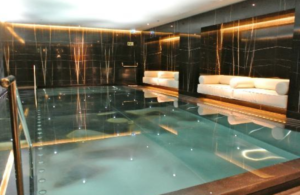 As one of the largest and most exclusive spas in central London, this urban oasis of tranquillity, boasts a 25m swimming pool, and its spa includes 11 private treatment rooms and one double spa suite, complete with its own steam room, jacuzzi and private treatment room. You can also book personal training in its state of the art gym. Escape from it all with this luxury hotel’s selection of carefully crafted day spa and residential packages. You will experience the most effective and luxurious ESPA Life treatments in London’s most breathtaking spa surroundings. With a day spa package, you can also enjoy all the spa facilities, including access to the gym, Vitality Pool, Amphitheatre Sauna, Steam Room and Ice Fountain. This is definitely a day to be remembered.